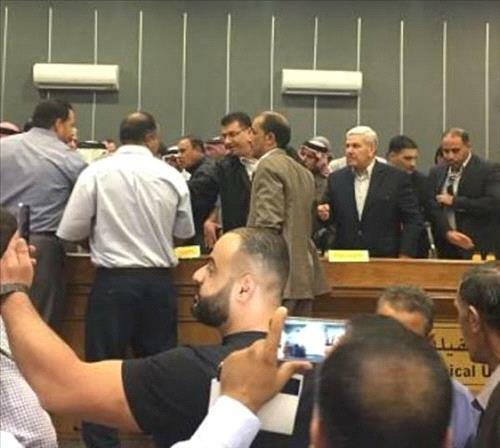 AMMONNEWS - Local figures in the governorate of Tafileh on Saturday boycotted a meeting with a ministerial task force on the income tax draft law to protest the bill. Agriculture Minister Khaled Hneifat told Petra that the meeting at the Tafila Technical University was part of the government's field tours to launch a national dialogue to arrive at understandings to address the economic hardship in the Kingdom. As the meeting got underway with speeches scheduled by ministers, a number of local figures walked out to express their rejection of the draft legislation, he said, stressing the citizens' right to express their views. The minister said "there is a rejection of this bill", but added that the exit from the current difficult situation warrants the passage of governing procedures and laws, pointing, at the same time, to dropping exports due to the closure of the border with Syria and its impact on the agricultural sector. Hneifat said he hoped that the draft law would help curb tax evasion and promote the national economy without affecting low-income groups. "What happened during the meeting, which was to present the income tax law, was expected as the citizens are living tough economic conditions and that it was an expression of their opposition to this law", said State Minister for Legal Affairs, Mubarak Abu Yamin. Tafila Governor Hossam Tarawneh said that the meeting was "trouble-free and there was nothing illegal", but it was an expression of the citizens' unacceptance of the new law.